Fancy doing something a little different, and a little festive this weekend? 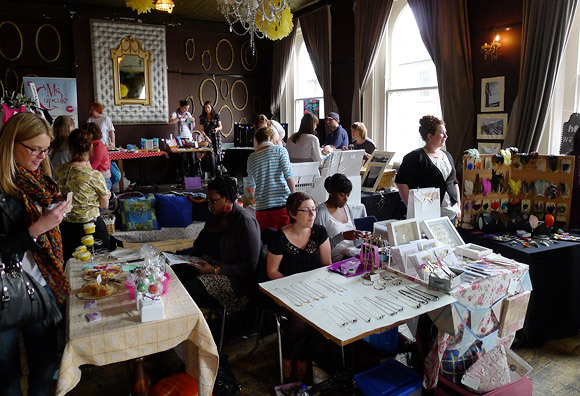 Then why not pop down to the Dogstar in Brixton and check out the Crafty Fox Christmas Market. With three whole floors of handmade heaven at your feet, there is bound to be something for everyone, with the market boasting over 40 unique designers and makers selling everything, from hand-made jewellery to customised cutlery. And let's not forget about the jam-packed schedule of activities and workshops ready for you to have a go at! Why not try your hand at bunting making? Or maybe even making your own Christmas decorations? The possibilities are endless! If you're just looking for a more relaxing afternoon out, you could always head over to 'The Tea Knees', Crafty Fox's very own pop-up tea room. Here you can sit, listen to what the Crafty Fox DJ's have on offer, and treat yourself to one of their delicious traditional cakes and cupcakes. Mmm! Entry to the market is free, with some additional charges for selected workshops. The first 50 people through the doors on Saturday and Sunday will also receive a free tote bag from Etsy UK. And while you're at it, any vintage fans out there might want to keep their ears and eyes peeled at what's going on down the road at the Living Bar!